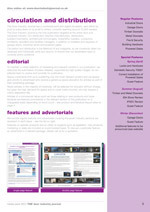 We are pleased to inform you that our 2012 Media Pack is now available to view or download from our website. Good News - Despite ever increasing costs, we have managed to reduce many of our advertising rates and have also introduced some new advert sizes at economical rates to assist advertisers with reduced budgets. Editorial - We are continuing our policy of offering advertisers a generous space allowance with their advertising package. However, to address the issue of providing free space for items from other sources, we have introduced a new policy. We will now publish free of charge newsworthy items from all sources, advertisers or non-advertisers, but anything of a commercial nature will now be featured on a chargeable basis at beneficial rates - see next item. Product & Literature Features - Within each section of the magazine we are now providing prominent coverage for new products and literature, at beneficial rates to allow non-advertisers to gain coverage without taking a display advertising package. Classified Advertising - Following several requests we have introduced a Classified Advertising section to attract advertising from product and service providers to the door and gate industry. Recruitment Advertising - To help you find high flyers, we have added recruitment advertising to our offering at competitive rates, which also include free online advertising until the position is filled. We hope you will find the changes outlined above useful, however, to see everything we have to offer in the Media Pack, such as direct mail and leaflet insertion, download or view your copy now. For further information on publicity and advertising please contact us.